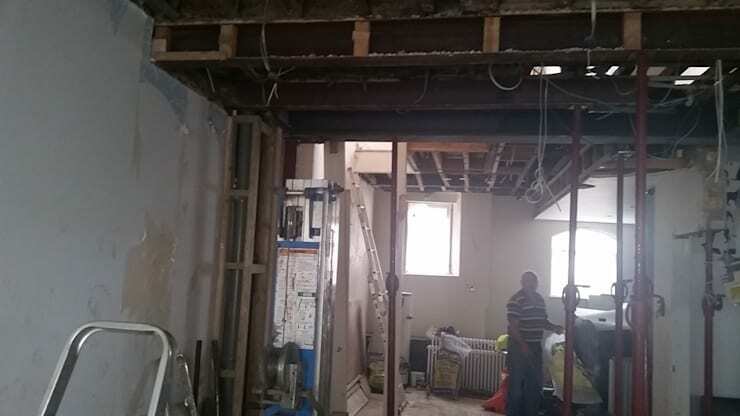 The old garage space was integrated with the living space of the house to introduce a more expansive layout, by tearing down walls. As well as this, interior walls like those between the living and dining were pulled down for a more modern and fluid design. The expanded living area now looks more suited for bringing in cosy and decorative accents in the future. And the architects found room to add a sleek staircase too, which leads to the upper storey. With fresh white paint on the walls and elegant dark grey doors, the living and dining areas look spacious, cheerful and extremely inviting. 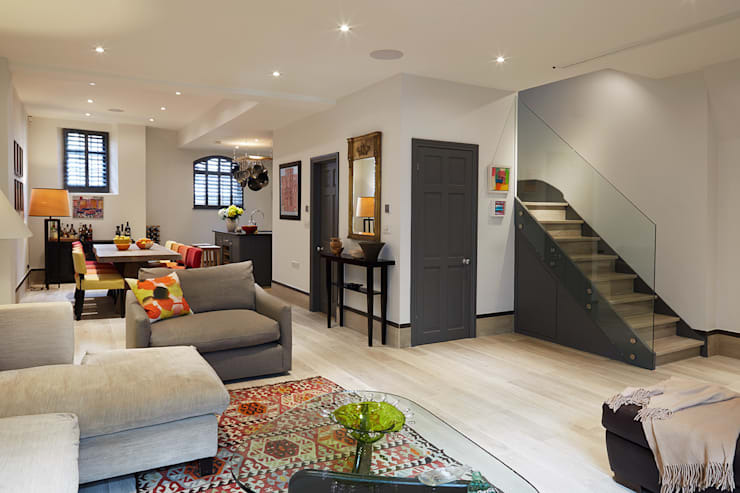 The wooden staircase with its grey side and glass balustrade enhances the openness of the hall, while powerful recessed lights on the ceiling liven up the home like never before. 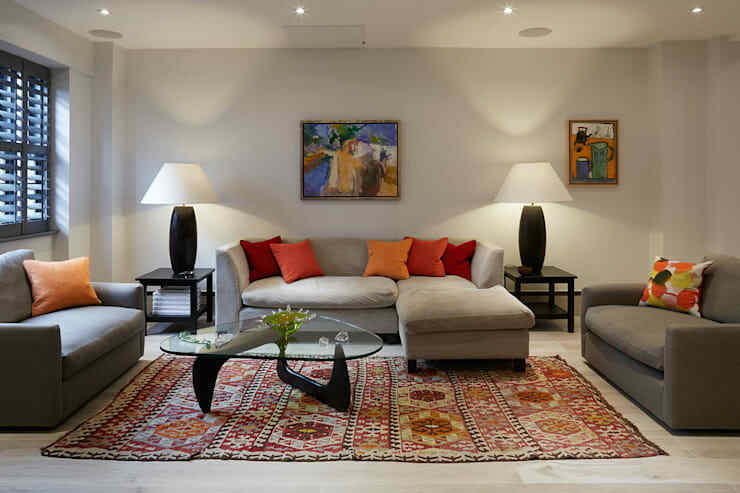 Vibrant artworks dot the interiors generously, while bright fabrics spruce up the furnishing. We especially love the elegant sideboard between the living and dining areas, and the tall mirror above it. With colourful cushions adorning the comfy grey sofas and a gorgeous patterned rug adding glamour to the plain floor, the living space is a stunner! The quirky coffee table can easily become a conversation starter, while the vibrant artworks on the wall can pique an onlooker’s interest too. The solid but chic lamps flanking the sofa cast a soothing glow in the evenings, while the louvre blinds on the left brings in sunshine and fresh air. Prior to the makeover, the kitchen had ample space, but needed contemporary touches for a more appealing look and feel. 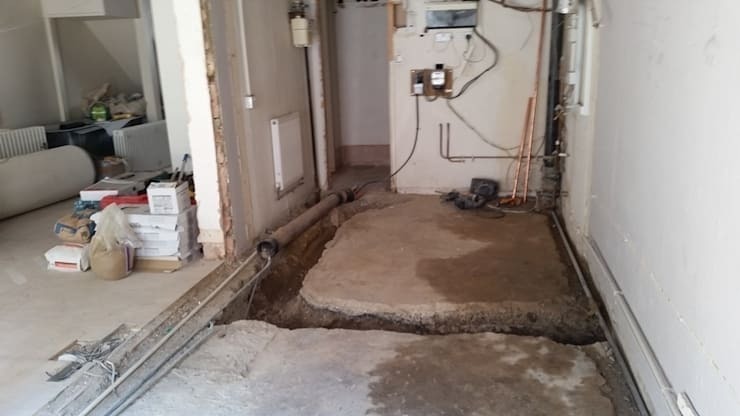 It was also necessary to improve the infrastructure, and install new electrical and plumbing lines. The open kitchen with its quaint louvre blinds now features fashionable grey cabinets, which contrast the whiteness of the walls nicely. A TV has been mounted in the corner too, so that you don’t miss your favourite shows while cooking or dining. The compact kitchen island with its overhead contraption for hanging pots and pans is a clever addition, and allows easy prepping of food. A vase of fresh flowers adds a hint of natural charm. In the dining space, a roughly-hewn plank of wood acts as the table, while pretty vibrant chairs in different hues accompany it for a quirky appeal. The sideboard is perfect for storing, mixing and serving drinks, and the painting above it offers a dollop of artistic thrill. 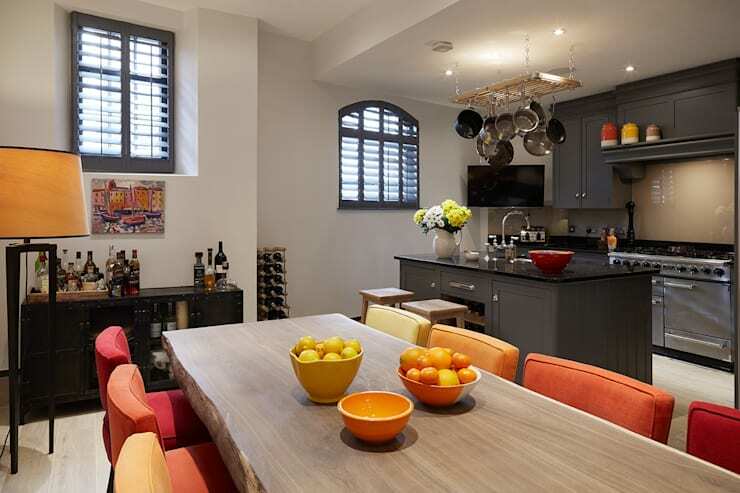 The remodelling of this once dull and cramped home is truly inspiring, with its clever expansion, use of brilliant colours, artistic decor, and simple but cosy furnishing for a relaxing lifestyle. Here’s another makeover story that you'll love: 4 spectacular small bathroom transformations. What do you think of this bright and bold makeover?